Trout House Village Resort rests along the northern shores of Lake George, NY. Located in the picturesque Southeastern portion of the Adirondack State Park, Lake George is a popular vacation destination with many hotels, resorts, and campgrounds ready and willing to meet demand. Knowing that they needed to find a way to stand out to new and returning visitors, Trout House Village Resort asked Mannix Marketing to design a new website that would attract organic and referral traffic from both desktop and mobile devices. Differentiation and competitive advantage in the hotel and resort industry often seems difficult if not impossible – especially in a popular and heavily saturated vacation market like Lake George. Our developers worked closely with Trout House Village to discover what makes their property unique and valuable to their clients. Armed with this knowledge and our own experience developing compelling hotel and resort websites, Mannix designed an image-rich site to grab user attention with new navigation that feels natural and keeps users interested across desktop, tablet, and mobile devices. The instinctual site navigation coupled with the visual emphasis provided by the image-dominant design really accentuates the appeal of Trout House Village Resort’s tranquil, lakefront property. To further delight visitors to the site, our developers created custom page layouts that allow travelers to explore the unique property and accommodations before they even get to Lake George. To help maintain the site’s fresh feel, Mannix designed custom lodging pages and layouts with a user-friendly interface so Trout House Village employees could continually refresh the site. 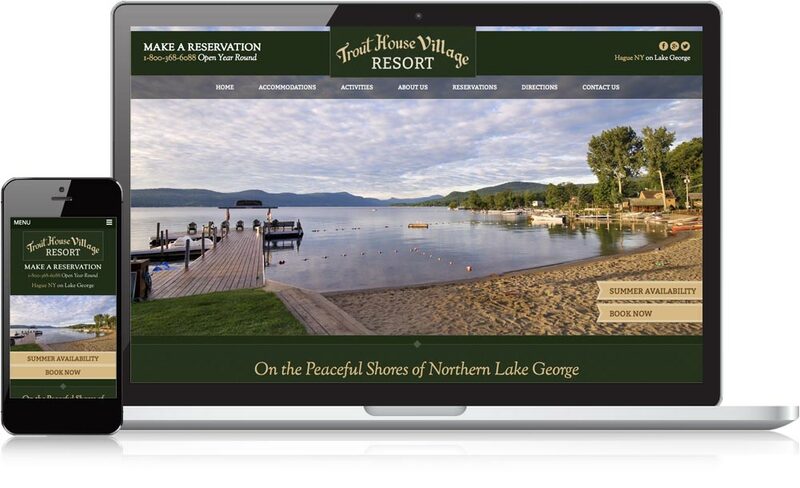 Around the time of their site redesign, Trout House Village also began listing their resort on LakeGeorge.com with display ads and various seasonal ad packages. These listing contributed significantly to the increased referral traffic to the site. Even more exciting, bounce rates show that the visitors coming to Trout House Village from LakeGeorge.com were happy with what they found on the site.